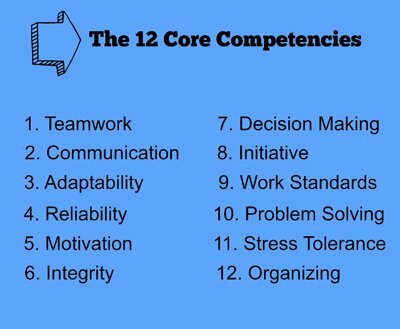 These are the 12 core competencies that have been identified as critical for successful job performance. 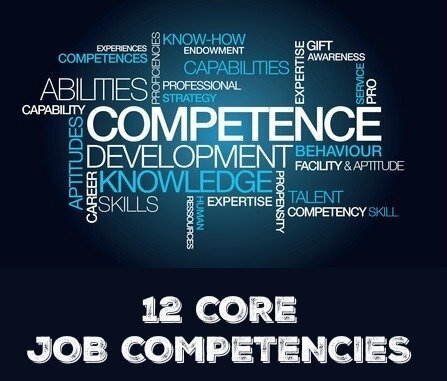 Different jobs demand different competencies, however these twelve competencies are the most commonly recognized behaviors required for success in nearly all career fields. Organizations will explore these key competencies in the job interview by asking competency-based interview questions, otherwise known as behavioral interview questions. First it is important to understand what a competency is. You will find many different definitions of this concept. Generally a competency is described as the knowledge, skills and behavioral attributes necessary for acceptable job performance. Knowledge refers to previous education and experience, skills refers to the technical or practical skills required to perform the job and behavioral attributes refer to personality characteristics that are key to successful job performance. Sets and maintains high performance standards. Pays close attention to detail, accuracy and completeness. Shows concern for all aspects of the job and follows up on work outputs. Displays energy and enthusiasm in approaching the job. Commits to putting in additional effort. Maintains high level of productivity and self-direction. Analyzes problem by gathering and organizing all relevant information. Identifies cause and effect relationships. Comes up with appropriate solutions. Able to effectively deal with change and diverse people. Takes action to influence events. Generates ideas for improvement, takes advantage of opportunities, suggests innovations. Displays emotional resilience and the ability to withstand pressure on an on-going basis. Deals with difficult situations while maintaining performance. Seeks support from others when necessary and uses appropriate coping techniques. This is done by asking the job candidate competency-based or behavioral interview questions that explore these competencies. "Tell me about a recent problem you discovered. What steps did you take to sort it out?" Go to behavioral interviews to find out the competencies relevant to different job types. Find out about management competencies at What Makes a Good Manager? Visit these job description samples to find which competencies are required for your specific job opportunity. Highlight relevant job competencies in your resume and cover letter.